Hoenselaar, Robert 2012. Further response from Hoenselaar. British Journal of Nutrition, Vol. 108, Issue. 05, p. 939. 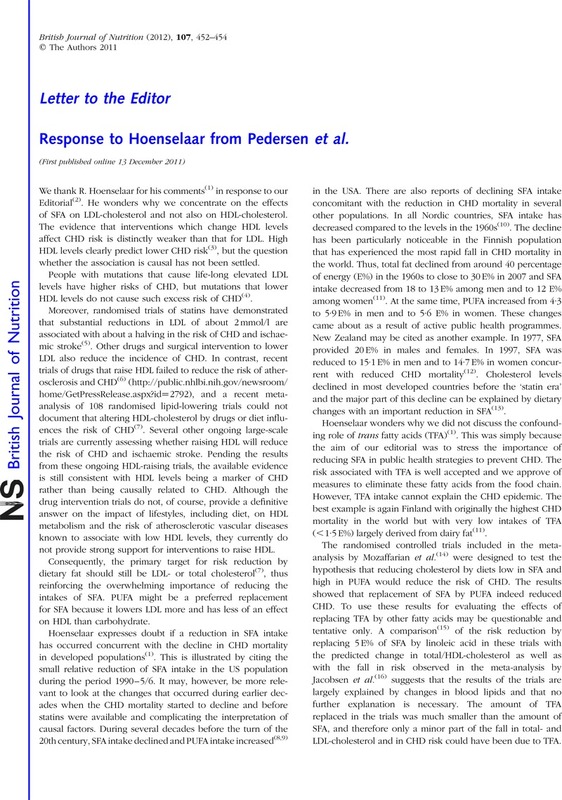 1 Hoenselaar, R (2011) The importance of reducing SFA intake to limit CHD risk. Br J Nutr 107, 450–451. 2 Pedersen, JI, James, PT, Brouwer, IA, et al. (2011) The importance of reducing SFA to limit CHD. Br J Nutr 106, 961–963. 3 The Emerging Risk Factors Collaboration (2009) Major lipids, apolipoproteins, and risk of vascular disease. JAMA 302, 1993–2000. 4 Teslovich, TM, Musunuru, K, Smith, AV, et al. (2010) Biological, clinical and population relevance of 95 loci for blood lipids. Nature 466, 707–713. 5 Cholesterol Treatment Trialists’ (CTT) Collaboration (2010) Efficacy and safety of more intensive lowering of LDL cholesterol: a meta-analysis of data from 170 000 participants in 26 randomised trials. Lancet 376, 1670–1681. 6 Barter, PJ, Caulfield, M, Eriksson, M, et al. (2007) Effects of torcetrapib in patients at high risk for coronary events. N Engl J Med 357, 2109–2122. 7 Briel, M, Ferreira-Gonzalez, I, You, JJ, et al. (2009) Association between change in high density lipoprotein cholesterol and cardiovascular disease morbidity and mortality: systematic review and meta-regression analysis. BMJ 338, b92. 8 Committee on Diet and Health (1989) Dietary Intake and Nutritional Status: Trends and Assessment. Chapter 3 in: Diet and Health. Implications for Reducing Chronic Disease Risk, pp. 41–84. Washington, DC: National Research Council, National Academy Press. 9 Stephen, AM & Wald, NJ (1990) Trends in individual consumption of dietary fat in the United States, 1920–1984. Am J Clin Nutr 52, 457–469. 10 The Project Group: Food Consumption in the Nordic Countries (2001) National, Annual Food Balance Sheets (in Swedish) TemaNord 2001:527. Copenhagen: Nordic Council of Ministers. 11 Valsta, LM, Tapanainen, H, Sundvall, J, et al. (2010) Explaining the 25-year decline of serum cholesterol by dietary changes and use of lipid-lowering medication in Finland. Public Health Nutr 13, 932–838. 12 Ministry of Health and the University of Auckland (2003) Nutrition and the Burden of Disease: New Zealand 1997–2011. Public Health Intelligence Occasional Bulletin No 17. Wellington: Ministry of Health. http://www.moh.govt.nz. 13 Capewell, & Ford, ES (2011) Why have total cholesterol levels declined in most developed countries? BMC Public Health 11, 641. http://www.biomedcentral.com/1471-2458/11/641. 14 Mozaffarian, D, Micha, R & Wallace, S (2010) Effects on coronary heart disease of increasing polyunsaturated fat in place of saturated fat: a systematic review and meta-analysis of randomized controlled trials. PLoS Med 7, e1000252. 15 Katan, MB (2009) Omega-6 polyunsaturated fatty acids and coronary heart disease. Am J Clin Nutr 89, 1283–1284. 16 Jacobsen, MU, O'Reilly, EJ, Heitmann, BL, et al. (2009) Major types of dietary fat and risk of coronary heart disease: a pooled analysis off 11 cohort studies. Am J Clin Nutr 89, 1425–1432. 17 Siri-Tarino, PW, Sun, Q, Hu, FB, et al. (2010) Meta-analysis of prospective cohort studies evaluating the association of saturated fat with cardiovascular disease. Am J Clin Nutr 91, 535–546. 18 Siri-Tarino, PW, Sun, Q, Hu, FB, et al. (2011) Reply to P Scarborough. Am J Clin Nutr 92, 459. 19 Stamler, J (2010) Diet-heart: a problematic revisit. Am J Clin Nutr 91, 497–499.